I can not start my day with out my coffee. I just hit the button on my coffeepot,and it starts brewing. Bob has it all set for me. Because I am one of those people that you can't talk to until I have at least one cup.. I then grab my cup and fill it up with my flavored creamer. 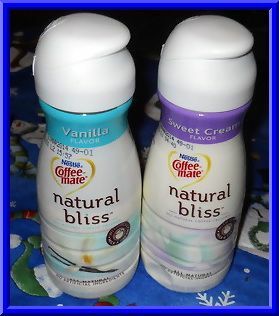 I have been using the flavored Coffee-mate creamers for years,so when the new Coffee-mate Natural Bliss came out I knew I had to try it! I was able to get 3 of the Coffeee-mate Natural Bliss flavors,Sweet Cream,Vanilla and Chocolate.There is only a picture of 2 as the chocolate one was gone before I could take a picture! So~I guess that you could say that Bob liked that one. Me~I like them all. And knowing that there are only 4 simple ingredients~milk,cream,sugar and natural flavor. I like the flavor of them all,as they put just the right about of sweetness in my coffee. Now,I can't wait to try the other flavors. I am thinking that these would even be good to add to hot chocolate. Simply Put~My favorite simple moment is coffee with Natural Bliss,my computer and warm socks! follow gfc - gloria m.
Has to be the Chocolate Bliss, but Peppermint Mocha is the bomb too!! I would like to try the Cinnamon Cream! 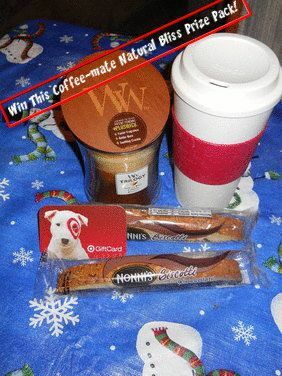 GFC follower Barb -----Barb S.
My favorite flavor of Coffee-Mate is Crème Brulée. I discovered Peppermint Mocha a couple weeks ago. I am in love. My favorite flavor is Spiced Latte. Angela L. or nomfreebies on GFC. I haven't tried it yet but I think I'd love Sweet Cream.